If you’re a fan of the banjo or traditional music, you won’t want to miss A Prairie Home Companion this weekend (http://prairiehome.publicradio.org/). It will feature Noam Pikelny and the Bay Area’s own Bill Evans. I’ve had the pleasure of taking in banjo classes, workshops, a private lesson, and a lecture on the history of the banjo from Bill. What a great combination of some of my favorite music with my favorite radio program! The program will air live from the Fitzgerald Theater in St. Paul Minnesota from 6-8pm California time on 88.5. Once a building permit has been obtained, most jurisdictions require that construction on the project commence within a certain amount of time (often 180 days). Usually the building department will need to perform at least one inspection inside this window to verify that work has begun, otherwise the permit will expire. An expired or cancelled permit can cost up to 1/2 the price of the original permit to renew, so whether you are an owner or contractor, try not to let this happen. If you know it’s going to be delayed for some reason, it is wise to inform the building department and apply for an extension, which are usually very easily granted. One of the reasons for this policy is that building codes change. Jurisdictions do not want to be held liable for sub-standard but otherwise permitted construction from an expired code. Placing deadlines on the life of a permit is one way to achieve this. While the 1997 UBC lasted for 10 years here in California, codes change much more often now. Local jurisdictions mostly adhere to a “California-ized” version of the International Building Code (IBC), which is published with revisions every 3 years. Jurisdictions in California will soon adhere to the 2013 California Building Code (CBC) based on the 2012 IBC. If you have any questions about one of your upcoming building projects, please feel free to contact Simmons Engineering. It was only when I lay there on rotting prison straw that I sensed within myself the first stirrings of good. Gradually it was disclosed to me that the line separating good and evil passes not through states, nor between classes, nor between political parties either, but right through every human heart, and through all human hearts. This line shifts. Inside us, it oscillates with the years. Even within hearts overwhelmed by evil, one small bridgehead of good is retained; and even in the best of all hearts, there remains a small corner of evil.
. . . If only there were evil people somewhere insidiously committing evil deeds, and it were necessary only to separate them from the rest of us and destroy them. But the line dividing good and evil cuts through the heart of every human being. And who is willing to destroy a piece of his own heart? I recently read a good article by Mike Michalowicz about reducing stress. He compares our fast-paced and evermore demanding lives to those of our founding fathers. I especially liked the idea of having business meetings outdoors in the shade, or even combined with other activities such as hiking (I suppose this is the idea behind meetings on the golf course, but I’ve never liked the excessive cost). Maybe there are some other ideas that you hadn’t considered. Enjoy the article (see below) and don’t be surprised if next time you come to Simmons Engineering to discuss your project, I invite you to take a walk around the block with me. The good news is that we are more productive than ever. For example, editing a high-production video a mere 25 years ago easily took 100 hours. Editing that same video today can be done in about an hour with a higher quality standard. That leaves 99 hours to sip margaritas (or Gravenstein apple juice :-)). Theoretically. The bad news is that we are more stressed than ever. Everyone is. It has become a global epidemic. Computer technology is a main contributor to our increased productivity. As a result, we put more on our plates than ever before. We expect more from ourselves and others. But because people aren’t computers, we’re not always faster. Perfect rarely happens. Expectations are not met. And we get stressed. One way to limit stress from your life, once and for all, is not to look forward to more tech solutions, but rather to look back at the lives of our less-stressed forefathers. As crazy as it sounds, those people from the colonial days did (perhaps unwittingly) several things that helped crush stress. Don’t get me wrong, they worked really hard. Every day was a fight to survive. But they did all the hard work with markedly less stress than us. Here are the five ways they did it. 1. Stop consuming so much news. There is a saying in the news industry: If it bleeds, it leads. In other words the more shocking something is, the more news coverage it gets. This may attract viewers for the news stations, but it also dramatically increases stress levels for viewers. The news is an exaggerated reality. You don’t witness murders, plane crashes, thefts and train wrecks daily. But that is what the daily news drip shows us. By refusing to watch or read the news, your stress will start to melt away. Our colonial fathers only got their news in weekly or monthly dispatches. Even our own parents weren’t subject to a 24-hour news cycle. Turn off CNN and Fox, and go out with some friends to talk. Don’t worry about missing anything. When something truly important happens everyone will be talking about it and you won’t be able to avoid it if you tried. 2. Meet outdoors. Once when I was struggling to find time to meet with a colleague, the only available window required us to meet at a mid-point location, which was a state park. We both lamented about the lack of a conference room. That is when my colleague had the idea of going for a hike. As it turned out, we really didn’t need a conference room. Instead of being cooped up indoors under fluorescent lights, we were out walking and talking. We accomplished more than we expected. And felt great in the process thanks to nature’s powerful stress-reducing properties. Our forefathers wouldn’t go inside a cramped, hot room to meet. They would go outside and find a nice shady spot to talk. Do the same by scheduling as many meetings as you can outdoors, and perhaps include some walking while talking. Getting sunlight and fresh air will reduce stress and may even increase productivity. 4. Drink and be merry. The drinking part is totally up to you, but being merry (spending time with others) is a great stress reducer. Time with others yields a few stress-reducing benefits. First, it gets you away from the gadgets and second, it gets you talking. No gadgets means no urgent demand can be thrust upon you. Sharing stories, experiences and problems is the ultimate way to vent stress. Our forefathers surely got this right. They knew how to throw great parties, and even required the guys to wear wigs. 5. No work on Sundays. Many colonists would not work on Sundays, per their religious beliefs. They had more than enough work on their plates to keep going seven days a week, but they were forced to take a break. In fact, some colonies even made it punishable to talk about work on a Sunday. Perhaps that’s not the most friendly way to encourage downtime, but it was effective, and work-related stress was reduced. You also need to schedule a day off (or days) in your schedule. These off days will not only recharge your energy, but will also improve your ability to fight off stress. Weekends are the obvious choice, since fewer people are expecting you to work then. But even that is changing, so pick your off times and day(s) now and make it your hard-and-fast rule now. Mike Michalowicz is the author of The Pumpkin Plan and The Toilet Paper Entrepreneur. He is a nationally recognized speaker on entrepreneurial topics and is the CEO of Provendus Group, a consultancy that helps companies whose growth has plateaued to move forward again. Want Small Feet? Read Fewer Books! Mark Twain once said, “There are three kinds of lies: lies, damned lies and statistics.” Confusion between correlation and causation has been the source of statistical lies for years. Technology such as radio, TV, and now the internet (especially spam email), have been ripe breeding ground for this sort of misinformation, which is almost always used to reinforce one’s bias. As polarizing as our news sources can be, I’m not nearly so concerned with bias, which I have come to expect, as with unfounded causal claims – often statistical – that support those biases. With all the bias out there, however, it’s important not to become so skeptical of numbers that we refuse to form opinions about important issues. This apathetic approach is a real temptation for me because there’s just so much data out there. The small portion that is accessible has been neatly packaged into far-left- or far-right-wing ideologies with political strings attached. I mean, really, who has the time to sift through all this stuff? On the other side of the opinion-forming spectrum, there is a very natural tendency to dive headlong into arguments when we hear statistics that justify our biases, especially from individuals who share our religious or political background. While cultural wisdom should not by any means be thrown by the wayside, when we lazily refuse to combine our analytical thinking powers and overly-rely on others who seem to know what they’re talking about, we risk being deceived and deceiving ourselves. This type of thinking leads to empty rhetoric, populism, and, frankly, an uninteresting existence. Hans Christen Anderson’s famous The Emperor Has No Clothes illustrates this idea well. Learning to separate correlation and causation is a valuable tool. It often makes it easier to identify bias and discredits the arguments of the overly-biased. Statistics can show many correlations, meaningful or otherwise. Take, for instance, water consumption and murder rates. While these two behaviors have increased concurrently over time – one could plot their correlative relationship very nicely on a graph – their correlation is not causal, they just happen to be related. Drinking bottled water does not turn people into killers, nor do killers disproportionately demand bottled water, i.e., one behavior does not cause the other. Generally, correlation is much easier to identify than causation, perhaps because it is so much more prevalent. All causal relationships are correlated, but not all correlations are causal. When we are indifferent to the outcome of the correlation, it is easy to dismiss a cause, but when dealing with a charged issue, say gun rights (no pun intended), something weird happens, especially when we are surrounded by like-minded people. We tend to become blinded to truth, jump prematurely to conclusions, and swallow statistics hook, line, and sinker. (C) Accidental deaths per physician are 0.171. (C) The number of accidental deaths per gun owner is 0.0000188. You be the judge: lie, damned lie, or statistic? . . . While I feel that supporters of gun rights shoot themselves in the foot when they forward this stuff on, I am neither excusing medical malpractice nor making a statement against second amendment rights. I simply use it as an example of the type of misinformation that should be insulting to our intelligence. Falsehoods in general, and correlation/causation falsehoods in particular, often follow a duck-duck-goose pattern, i.e., truth, truth, BIG FAT LIE. And it’s no wonder – throughout history, this type of lie has always been most effective. All these statistics show is that there is a greater correlation between accidental deaths and people who see doctors than between accidental deaths and people who come into contact with gun owners. You could walk past a non-gun-carrying gun owner on the street or at church, and statistically, this would help lower the latter correlation. So, while relative levels of correlation have been established with fancy statistics, the comparison between the two correlations is pretty meaningless. Here’s why. In order to prove a causal relationship, in this case that seeing a doctor causes you to die 9,000 times more readily than from accidental gunshot (although the conclusion of the spam mail leaves the accidental part out at the end), one would need to perform a controlled study in which two groups share all meaningful characteristics. People who are seen by doctors typically have health conditions vastly different than your Average Joe walking down the street. Emergency rooms are filled with people having a much higher probability of being accidentally diagnosed and dying as a result than I have of being killed by a gun owner while I sit and type this article. When we come into contact with a poor line of logic that is being used to persuade us to believe a certain way or do something, we should naturally feel uneasy. Skepticism and doubt are healthy senses that should always be addressed and never ignored. Dealing with these feelings appropriately will weed out mistruths and give us greater clarity and confidence in those assertions that survive the weeding out process. When confronted with biased statistical misinformation, that correlation does not always imply causation is often at the core of our unease. So, why, I have wondered, does this type of misinformation spread so quickly? To paraphrase someone (and it has never been more true than it is now), “Rumors and lies can make their way around the world before the truth can get out of bed and put its boots on.” One universal human shortcoming is that we are much more entertained by a good story – forget about whether it’s true or not – than the poor old, humble, boring truth. Stretched stories and half truths are strewn throughout the canon of our national literature and songwriting. Hyperbole, machisimo, smoking guns, bravado – this is the American part of us, most expressed in the American South (and to a lesser extent in the West) that is exciting and invigorating. Too much New England sensibility and life becomes uninteresting, even if rational. Another aspect of our national character that may ripen the breeding ground for poor statistical reasoning is over-confidence in our moral superiority. Most of us see ourselves as moderate with all the coo-coos on either side of us. I know that’s how I see myself as a driver – everyone else drives either too fast or too slow. When we are convinced that our way is the right way, statistics that confirm our previously-held conclusions simply don’t undergo the same amount of scrutiny as those that question our conclusions. Both of these tendencies – flare for the dramatic and certitude of one’s rightness – can be used to either further human progress or dull its mental capacity. They led Jefferson to write the Declaration of Independence but they also led a misguided spammer to claim that doctors kill 9,000 times more people than gun owners. One of my big concerns and, I suppose, a source of sadness, is that as we become more and more informed in this information age, we are not becoming, as one might expect, more unified. On the contrary, we are becoming more opinionated and polarized. Information, much of which is statistical, has become a weapon for putting down others. What we are doing with information is destroying our civility. Social networking is pushing us further into circles of shared belief and the people with whom we share information are becoming more homogeneous. At some point, when we come to believe there can’t possibly be anything new that we haven’t already considered, when our world becomes so narrow that we despise surprise, we enter a thick-walled box of self-deception that is at the root of conflicts small and large. So what? I guess my conclusion is that we should avoid judging too quickly without a fair level of sophistication on one hand, and we should avoid not judging at all due to apathy on the other hand. And whatever we conclude, we should leave some room for surprises. Should Building Green Be Mandated? This month marks the publication of yet another new building code — the International Green Construction Code (IgCC) 2012. While local jurisdictions have the option to adopt it or not, the intent is clearly to offer cities a framework from which they can now mandate use of green technologies rather than merely provide incentives for their use (see, for instance, the United States Green Building Council’s LEED program). Back in 2007, Davis Langdon wrote a thought-provoking report entitled, “Cost of Green Revisited: Reexamining the Feasibility and Cost Impact of Sustainable Design in the Light of Increased Market Adoption.” Using cost data from hundreds of buildings, he demonstrated that when sustainable technologies are incorporated into a project from the outset rather than added on as “extras,” the cost of LEED certified buildings was comparable to non-certified buildings. So my question is this: Does building green need to be mandated? If it makes more economic sense to incorporate green features into a building, why not let people make this decision and feel good about it rather than forcing them to do it with a heavy hand and generate feelings of discord? Personally, I am in favor of good, sensible, and sustainable design practices. However, I feel that good design should be able to stand on its own merits rather than be mandated. I would prefer that the IgCC and all sponsoring organizations protect the reputation of building codes by limiting them to issues concerning life and safety. Let designers lead the way in promoting green. Like in agriculture, I’m all for diversity when it comes to energy sources, and for the same reason — resilience. The more spread out we are, the less susceptible to catastrophic failure we become. (In structural engineering, we refer to this principle as redundancy and building codes give big rewards to structures that have backup load paths in the event that a single element in a particular load path fails.) No single present technology has all the answers, but many of them have some of them. Improving upon the technologies that we do have and focusing on those that have the least side effects seems to be a reasonable approach. There’s a painting with a plain wooden frame that hung, I am told, in my grandparents’ kitchen when my mom was a girl. When she married and started the home in which I was raised, she displayed it in her dining room. Unaware as I then was of its general appeal and the fact that it even hung in the Louvre, I was first attracted to it because of its simple connection to home. As I grew older, I became attracted to its warm earthy hues and simple rural theme. Today I am inspired by its poignant message, of which I am reminded daily as it now hangs (in the same old wooden frame) in my home not far from where my family shares its meals. It’s a simple painting, and a complicated one. It can be seen hanging in the Taylor’s living room in old episodes of TV’s classic ‘The Andy Griffith Show,’ a symbol of Mayberry’s simple ways and people. And while the real Andy Griffith is revered today as the spiritual godfather of the North Carolina Democrat Party, he was no socialist. Rather, his loving yet firm, altruistic yet practical ways could be considered, as much then as today, the embodiment of what makes America great. Juxtapose this with its complicated origin. Having been painted shortly after the French Revolution of 1848, it is no surprise that Millet was at first accused of being apologetic to the workers and socialist movement. Millet insisted that he had no political agenda. He was, however, irked that the man who bought it low balled him by 25% of his asking price and refused to budge. Desperate, Millet took the money, but kept its embarrassingly low sale price a secret his whole life. It is ironic that fourteen years after the artist’s death, it sold for one hundred times what he originally got for it while Millet’s family continued to struggle financially. My maternal grandfather (the one who bought the old reproduction that now hangs in our house) was a political historian with many tolerant world views. After serving multiple campaigns as a medic (many of whom, I recently learned, were professed pacifists) during WWII in the South Pacific, he attended the University of Utah where he wrote his masters thesis on the political philosophy of H.G. Wells. A great admirer of Hinduism and Gandhi, he studied on a Fullbright teaching scholarship in India for a summer and, for a time, wore a beard and pagri. It makes me wonder about the aspects of the painting’s message that must have appealed to him. Fast forward to forty years later . . . As a student at Brigham Young University (unable to wear a beard or pagri), I visited my then-girlfriend-soon-to-be fiance’s home for the first time, and there it was again, hanging in the sewing room next to another Millet painting of two peasants praying. I thought it was a sign! Then again, most recently, when our family moved to our current home, we were both delighted to see it hanging in the Relief Society room in our church building where we meet for Sunday School. So, what is its universal appeal, and why do people who hold such seemingly varied worldviews claim this painting as their own? Having done a little research on it one recent Sunday afternoon after church, I’d like to share some of its fascinating history and consider some of the possibilities for its transcendent appeal. In the old days, according to religious code, farmers were to leave the corners of their fields unharvested. They were also to leave any leftovers, allowing a generous portion of their work to be harvested by the poor, which included widows, orphans and strangers. Similar practices were carried out in vineyards and orchards, and this served as the basis of one of society’s first welfare systems. 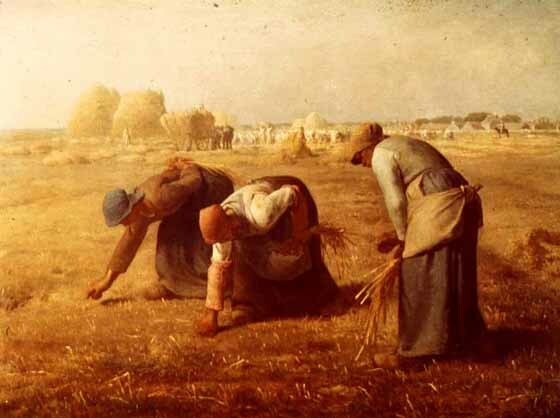 From an art historian’s perspective, if you look closely at a good reproduction of this painting, Millet seems to have made it clear that the light and abundance is only near the horizon where the wealthy landlord looks over his bounteous harvest, while the peasants are in muted tones and shadows, clearly part of a separate existence. Further reinforcing this theme, the vanishing points created by the backs of the working peasants in the foreground are completely unrelated to the bounty in the background. Many artists have idealized the nobleness of working peasants who eat by the sweat of their brows and burden of their backs. While a student, I was very drawn to the work of western artists who celebrated honest toil, in particular Maynard Dixon and Mahonri Young. Often, I felt guilty for the relative “easiness of the way” and went through periods of time when I craved physical work, even dropping out of college at one point to work as a manual laborer. Prior to my engineering studies, as a student of Russian literature, I remember with great fondness sharing bread and honey with friends on campus lawns and on hikes in Utah’s beautiful mountains. We discussed the works of Pushkin, Gogol, Lermontov and others. I was a devoted scholar of Tolstoy, who strove toward the simplicity of the peasant life, yet always seemed to fail at realizing his impossible ideals. Looking back on this time, I realize that I have even more questions now than I had then. While I once saw so clearly the need for mankind to work towards a more just and efficient social order based on honest work and brotherly love (and, later, engineering efficiency), I recognize now the limitations of this ideal under the present circumstances. The protestant ethic of hard work, freedom to pursue one’s self-interest, and religious conservatism, all pilars upon which American economic supremacy were built for two hundred years, appears to be in the process of being replaced by something else. I have some loosely held opinions along with some firm convictions regarding the matter, but after going on and on in my initial draft of this post, I’ll spare you the agony. I really don’t know where we’re headed in the next couple decades. I will, however, just share an excerpt from a 1978 commencement address by a Russian academic entitled, “A World Split Apart.” It was given at a time when the “split” was much more defined, consisting of two world superpowers that flexed their military muscle at each other, flirting with what could have brought the world to ruin. It’s interesting to contemplate the “split” that we now see, one that is much more ambiguous, but no less disastrous . . .
Here’s a link to the complete address. How Strong is a Spider Web? I was excited this winter when my 5th grade daughter chose the topic for her science fair report: ‘How Strong is a Spider Web?’ After placing third last year for her report, ‘What do Hummingbirds Like to Eat?,’ we had high hopes for another strong performance. One of my rules has been that I provide help at the beginning, but from then on she’s on her own, so I’m never quite sure how it’s going to turn out. Well, a couple months ago we sat down together and considered all the different possibilities that might affect a spider web’s strength — span, angle, heat, amount of stickiness, etc. Then she went around our neighborhood for a month collecting data and dropping as many paperclips, her chosen unit of weight, on different kinds of webs until they failed. One of her discoveries was that the strongest spiderweb held over fifty paperclips, more than five times as much weight as she thought it would. She also validated her hypothesis that the sticky black widow webs would be the strongest, all on her way to a first prize at the science fair. Since biomimicry — using biological lessons to improve the efficiency of human designs — has long been a fascinating topic to me, I was very interested in this article that appeared this morning.